A: Once the reservation is booked there will be no refunds of the deposit. We will apply your deposit to your next event within a one year period if you cancel at least 14 days prior to your event. Any cancellation within 14 days of the event will result in a forfeiture of your deposit. Tents, Table, and Chair Reservations are non-refundable. A: Absolutely, we are a full-service event rental company that travels throughout Florida, Alabama, and Georgia. Please contact us if you are not within our immediate service area for a quote. Minimum orders may apply to cities outside our service area. A: That depends on how many rentals we have that day. We will contact you the day before your rental to schedule drop off and pick up times. Tents, Table, and Chairs are usually delivered the day before the rental and picked up the day after the event. Q: We have rented some really dirty equipment from other companies in the past. Are they always that dirty? A: No. All event rental equipment should be clean when you get it. 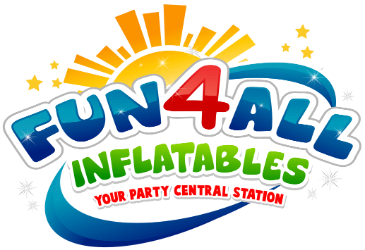 Fun 4 All Inflatables cleans and disinfects after every rental. Q: Do we have to keep inflatables plugged in the entire time? A: Yes. A blower keeps air in the equipment the entire time. Once unplugged they deflate. That's why we require an outlet within 50 of the unit or a generator. Longer cords can pop your circuit breaker so we bring our own heavy duty cords. A: We only accept Credit cards for the deposit the balance is due by cash or check only. If paying by cash, please have exact change as our drivers do not carry cash. A: Yes, a $50 Deposit for reservations under $499.99 and 50% deposit on orders over $500.00. Tents, Table, and Chair Reservations are 50% deposit. ALL DEPOSITS ARE NON-REFUNDABLE. A: Check the requirements listed with each inflatable. Also, make sure you have at least a 4 access to the area where it will be set up. The jumps can weigh up to 650 pounds so we need a clear path with ample room. Q: What are your returned check fees? A: We charge $35 for a returned check. A: We can set up on Grass (our favorite and best for the kids), asphalt, and concrete. We also love setting up indoors. Sorry, we can't set up on any type of rocks as the constant rubbing will wear through the inflatables.Sand, We will setup on sand, but cleaning fees will apply. A: Yes. There is a link in your receipt once you've ordered or you may click here to view a sample. Still have a question? Please complete the form below to e-mail us.